In 2019, we are delighted to offer an expanded set of learning experiences: our usual Passport and Adventure Series workshops, plus an entire week of post-processing skills development! At Adventure Series workshops, we take you to other interesting natural wonders that may be on or near national and/or protected lands, perhaps during singular events (such as an eclipse), sometimes focusing a little less on instruction and more on field time, exploring and creativity, or sometimes focusing on advanced night photography techniques. And in our brand new Skills Development Workshops, we focus on honing specific abilities. This year, we are offering a post-processing intensive to help you master everything that happens after the shutter closes. Experience the mysterious night skies in the mountains, coves and rivers nestled at the borders of Tennessee and North Carolina. Join us for the gently moon-kissed cliffs, mountains, coves, riversides, preserved cabins and churches of this historically pivotal national park. 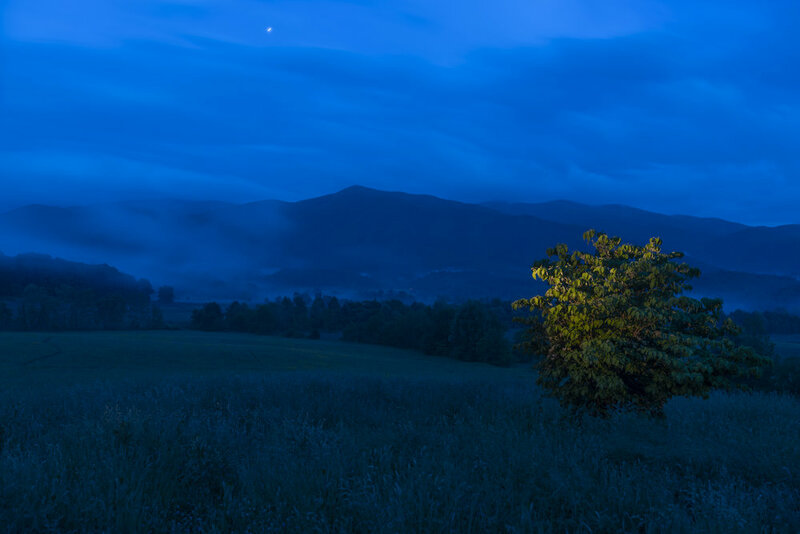 From the rolling valley of Cades Cove to the peak of Clingman’s Dome, we’ll explore the mercurial and mystifying skies of Great Smoky Mountains National Park. Unique, awe-inspiring, incredible. Bryce Canyon National Park is a location like no other. In the surreal and vast expanses of the Utah landscape, we will spend a magical week exploring the otherworldly hoodoos of Bryce Canyon National Park. The crimson, orange and yellow rock spires make the perfect foreground for our night photography. Experience the incredible mountains and skies of the Crown of the Continent, Glacier National Park. Lassen Volcanic National Park is home to steaming fumaroles, meadows freckled with wildflowers, clear mountain lakes and all four different types of volcanos. Jagged peaks tell the story of its eruptive past while hot water continues to shape the land. Lassen Volcanic National Park offers opportunities to explore and photograph a majestic landscape that is distinctly a part of the American West. Explore and photograph raw desert landscapes and rock formations under some of the darkest skies in North America. Big Bend National Park is pretty raw country. It’s also pretty. Especially in the right light, and double especially at night. All the rock formations, all the canyons, all the mountains and valleys and dirt roads and ruins—all sit under some of the quietest and darkest night skies of North America. The landscape is at once harsh and beautiful, at once hard and delicate, at once tough and mesmerizing. And we’ll be there to capture it all under the October stars of Texas. Enigmatic Easter Island. At night. Need we say more? Few places on earth are as mysterious or compelling as Easter Island. 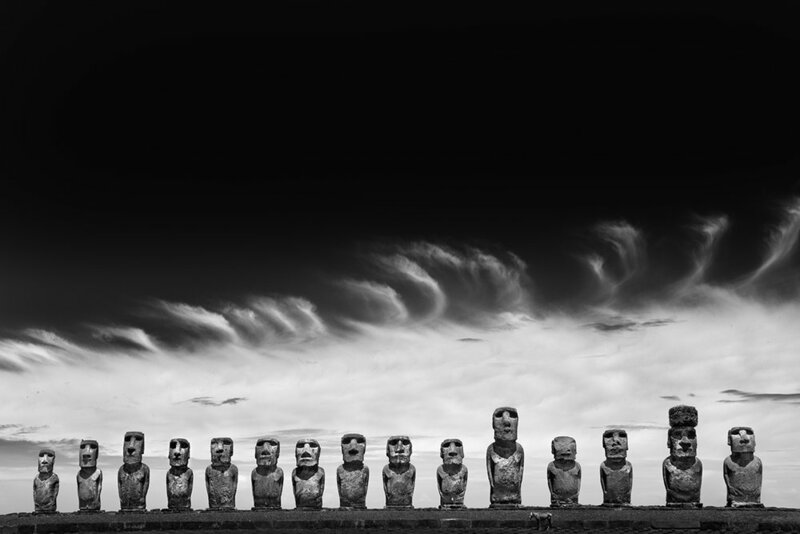 The giant stone figures known as Moai oversee this remote island 2,200 miles off of the coast of Chile. Most of Rapa Nui, as it’s known to the locals, is a national park. Not only is it hard to get to here, but it is notoriously difficult to access the park at night. In February of 2019, National Parks at Night will be taking 10 lucky people to do just that. Morocco—the gateway to Africa and the bridge between Eastern and Western cultures. Morocco is a land of large bustling cities, tranquil seaside towns and remote mountain villages. Our photo tour avoids the major cities in favor of smaller, quiet places away from most of the tourists and tourist traps. The port city of Essaouira, the kasbah at Ait BenHaddou and glamping in the Sahara desert will be the highlights of our adventure. Join us for the broad, red mountains, valleys and arches within Valley of Fire State Park and the abandoned wonderland of the Nelson ghost town. We’ll explore having fun with light and stars in these desert jewels of the American southwest. Join us to explore the strange stone mountain of America’s first national monument. Revered by Native Americans in folklore, shrouded in mystery, we’ll explore the mercurial skies of Devils Tower. Hike to the shores of Shi Shi Beach in Olympic National Park, to camp under the Milky Way and photograph the sea stacks and stars. Shi Shi Beach is a remote photographer’s paradise, reachable by six miles of round-trip hiking, plus a little more to reach nearby Point of the Arches. We will hike first to Second Beach for a warm-up night of camping and photography, then to Shi Shi for a two-night, three-day, adventure among the stars and the starfish, the sand and the sea stacks. We will photograph ebbing and flowing ocean waters, tidal pools, Pacific sunsets, and of course the Milky Way and the beautiful Olympic night skies. Photograph under the starry night skies of Cape Cod’s Province Lands, among towering lighthouses, rolling sand dunes and peaceful shores. Cape Cod’s Province Lands comprise a captivating collection of simple scenic wonders. Ponds. Beaches. Sandy dunes. Pine forests. Lighthouses. Old dune shacks. Cranberry bogs. Atlantic waves cascading onto the coast. These old shores hold countless treasures for the night photographer. We’ll explore them all, and more of what Cape Cod offers, during one of the peak of the region’s finest season: a New England autumn. Like a beacon at the end of the world, San Francisco’s diverse land and skyscape will guide our exploration into our first urban workshop. We will focus our lenses on the winding streets and bright city lights, but also explore the coastline, bunkers, bridges and ruins that intersect the beautiful Bay Area. We will challenge you to re-interpret the city with a multitude of long exposure and processing techniques that will leave you with a unique and fresh view of The City by the Bay. Join us for a rich photographic and cultural tour of Cuba—focusing on the people, the arts, the food and the landscapes of Havana, Las Terrazas and Viñales. On this photography and cultural tour you’ll experience the best of Cuban culture on an island with photo opportunities everywhere you look. In Havana we’ll explore life in the streets both day and night, plus the vibrant art and music scenes, architecture, people and cuisine. We’ll road-trip to Las Terrazas and Viñales Valley (a UNESCO World Heritage Site) to photograph Cuba’s magical landscapes. This boutique tour will give you access to Cuban experiences you’d never be able to create on your own. All you’ll need is an adventurous spirit and flexible mindset (it’s Cuba!). Take complete creative control over your imagery with Lightroom and Photoshop post-processing skills. You’ve spent a lot of time building your camera skills and honing your photographic vision. Now it’s time to take it to the next level. Post-processing has become an integral part of nearly every discipline of photography. Just as the black and white photographers of the 20th century were able to creatively interpret their work in the darkroom, we can now use modern technology to enhance our photos, and even to create images that were impossible only a few short years ago.